Pragmatic Play (Top Game) always has surprises in store for people playing its games, and Sweet Surprise slot is a good example of what this world-renowned gaming developer is capable of. This is a well-made game that stands out from the crowd because of its fabulous gameplay and visuals. Players also love this game because of its ample bonuses and progressive jackpot. It has been made available for mobile gaming as well, and can, therefore, be played on almost any smartphone or tablet in addition to PC. 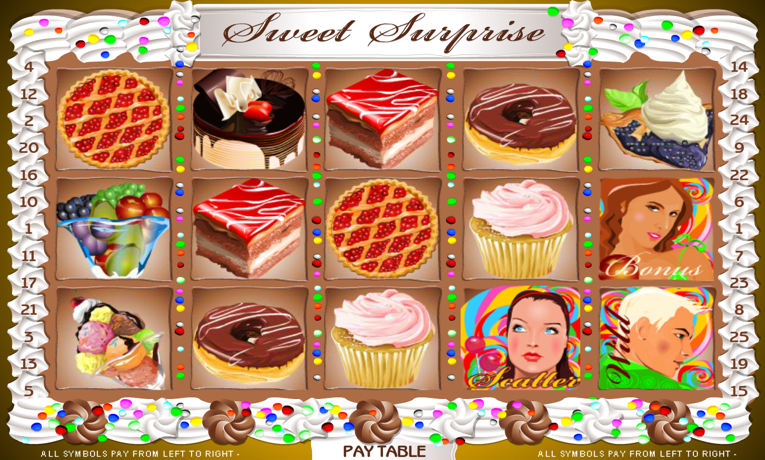 Sweet Surprise has five reels and 25 selectable pay lines spread over three rows. The minimum bet that can be placed on a pay line is 1p and the maximum is £5. The minimum wager that covers all pay lines is therefore 25p and the maximum is £125. It takes a minimum three identical symbols lined up in a row to get a payout. This slot game has very interesting bonus features that can generate exciting wins. There are two scatter symbols here. The Blue-Eyed Girl symbol is the first one and it lands on the second and fourth reels only to deliver free spins. The Sweet Apple Girl is the other symbol and it lands on the first, third, and fifth reels to trigger the bonus game. This is a pick’em bonus game that delivers a prize that can vary from 34 to 170 credits. 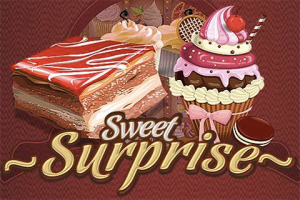 There aren’t too many free spins available in the Sweet Surprise slot game. In fact, players get five free spins when two of the Blue-Eyed Girl scatter symbols land on the reels simultaneously. There is a Wild symbol in the game, like in most slot games, and it can replace any symbol in the game except for the two scatter symbols. The Lollipop Ladies Man symbol is this game’s wild, and its arrival is eagerly awaited because of how it can complete winning combinations. This symbol also delivers a progressive jackpot win, called the Stars and Stripes Jackpot, when five of it land on a row. 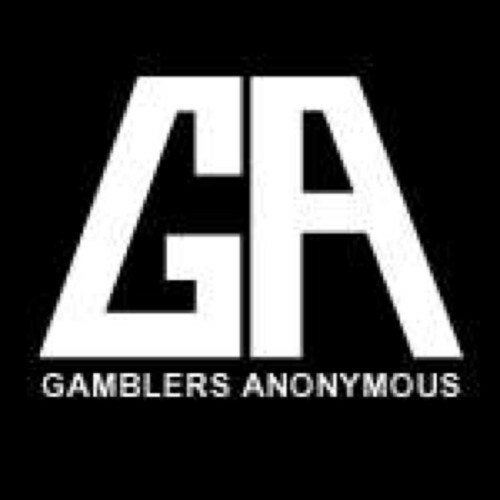 However, this only applies to a game where all pay lines have been activated with the highest wagers. The jackpot occurs on a fairly regular basis and many high rollers have benefited from it by now. The Cherry Pie symbol is the highest paying one in the Sweet Surprise game. Getting five of these symbols in a row will result in the regular (not progressive) jackpot worth 2500 coins. The Fruit Bowl symbol comes next with 1000 coins and it is followed by the Ice Cream Sundae symbol which is valued at 500 coins. The Chocolate Frosted White Cake symbol com finishes up this list at 400 coins for five in a line. We feel that Sweet Surprise is one of Pragmatic Play’s better progressive games. Its wins, including the progressive jackpot, happen at a surprisingly frequent rate even though they aren’t the biggest ones in the business. The look and feel of the game are also very attractive, with its surfeit of sweet treats and a 70’s soundtrack. 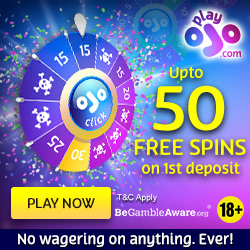 We have to admit, however, that the number of free spins offered by the game was really quite disappointing. Players do enjoy getting lots of free spins, and a mere five just doesn’t feel good enough. Even so, this is a very good game overall!. It is the one that we are certainly going to recommend to our readers. They’ll make a steady amount of money playing this game and will have an immense amount of fun in the process.